Germany's Federal Cabinet, led by Chancellor Angela Merkel, has approved a 2012 budget proposal that will boost federal research and education spending to ?12.8 billion, up 10 per cent on 2011. In announcing the budget package, education and research minister Annette Schavan said that the huge increase will focus on research to help Germany become a global high-tech leader, especially in the fields of climate and energy, healthcare and nutrition, transportation, security and communications. 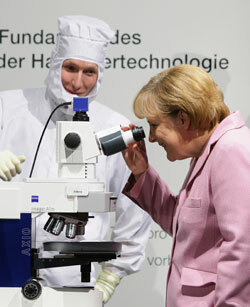 This push for leadership will be coordinated by Germany's High-Tech Strategy 2020 initiative. In a statement issued after the approval of the proposed budget on 6 July, Schavan described the increase as an 'investment in heads' designed to 'wake up' and develop existing potential. 'In a country of few natural resources like Germany, this is an essential investment in the future,' she said. The DFG budget will rise by 5 per cent in 2012 to around ?4.3 billion, according to the research ministry. Von Kreisler said that the federal government's contribution accounts for about 58 per cent of the DFG's budget, with Germany's 16 states contributing the rest. Although the budget still needs final parliamentary approval later this year, von Kreisler said that this is a formality. 'I know there is the political will to approve it,' he said. The three biggest spending categories in the budget are project aid, institutional aid and special aid. Project aid receives a rise of 17.1 per cent to ?5.38 billion. As well as HEP, project aid includes the Excellence Initiative, designed to create a so-called German Ivy League of top universities. Institutional aid funding will rise 6.8 per cent to ?4.43 billion. In addition to DFG funding, this category includes funding for the Max Planck Society, Fraunhofer Society, and the Helmholtz Association. Special aid will receive an additional 3.3 per cent at ?2.86 billion. This grouping provides financial assistance to university students, as well as continuing education programmes and trade education. However, Koch says that the government's focus is on the High-Tech Strategy 2020 initiative and chemistry is taking a back seat. 'While chemistry is certainly essential here, it is not mentioned explicitly and we have the impression that the ministry still is not really aware of the important and underpinning role of the chemical sciences,' he says.